“When our elder son Gunasekaran was born, we were horrified. He did not have a mouth – no lips or even gums…just a hollow opening in the place of his jaw. 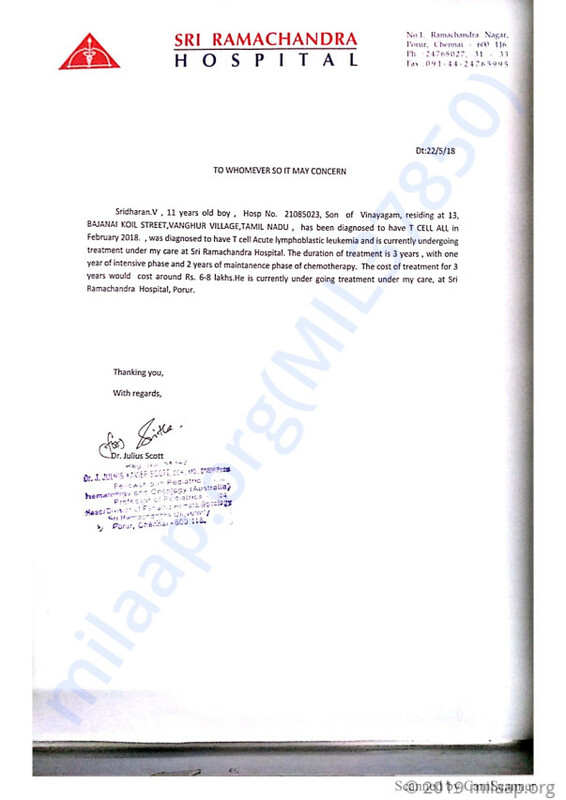 My husband, Vinayagam, immediately sold the only piece of land we had for a small amount because of the emergency; we had been borrowing money for everything since then. He was just getting better when my younger son, Sridharan, was diagnosed with cancer. 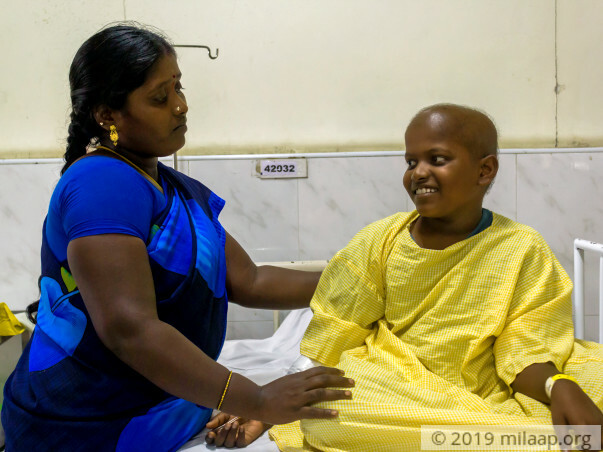 Now we have been pushed to a financial position where we cannot save either of our sons.”-Jaya Malini, mother of 11-year-old Sridharan who is suffering from acute blood cancer. 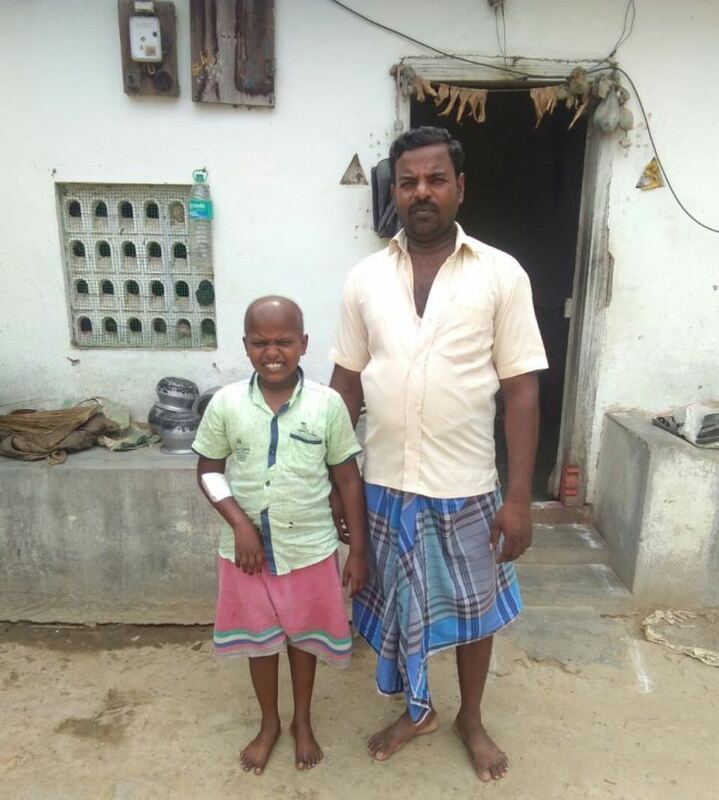 When Sridharan complained of severe stomach pain three months ago, his worried parents did not hesitate in taking him to a local medical centre in their hometown of Velur, Tamil Nadu, immediately because he was not a child who got sick too often. A couple of tests revealed that his liver and spleen had abnormal swelling and told them to go immediately to Chennai for better treatment. “The serious look on the doctor’s face scared me. He told us that there was no time to waste and to go to a good hospital that day itself. I did not have money for the bus tickets so we had to leave for Chennai after two days because I couldn’t arrange it immediately. In Chennai, Sridharan was diagnosed with blood cancer and was started on chemotherapy immediately as his cancer had the risk of spreading to the rest of his body and it didn’t matter if we had the money or not.”-Vinayagam, Sridharan’s father. “We are ordinary farmers who are now farming on a rented land because we had to sell our only piece of land to get our elder son treated for his mouth deformity. For 15 years after his birth, we have been borrowing money to treat him and keep up with family expenses. Things were really difficult but we kept going for our children’s sake. And we were quite happy because Gunasekaran was getting well. Just when we thought that our lives were on the right track, Sridharan got sick. His disease is so terrifying that we know he will not make it without advanced treatment. 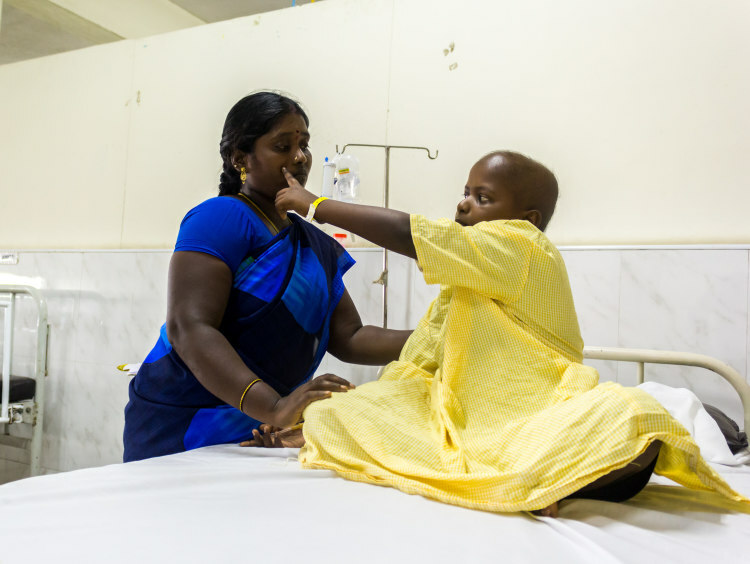 But we don’t have the money to take him to the hospital regularly, let alone get him treated.”-Vinayagam. 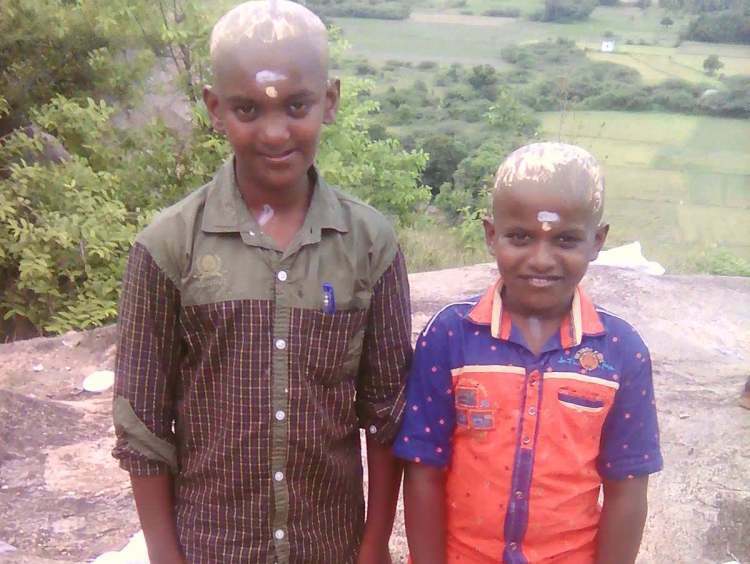 Sridharan and his brother Gunasekaran are very close. They have no secrets between them – this is exactly why their parents have to be extra careful when discussing his disease or money issues at home. 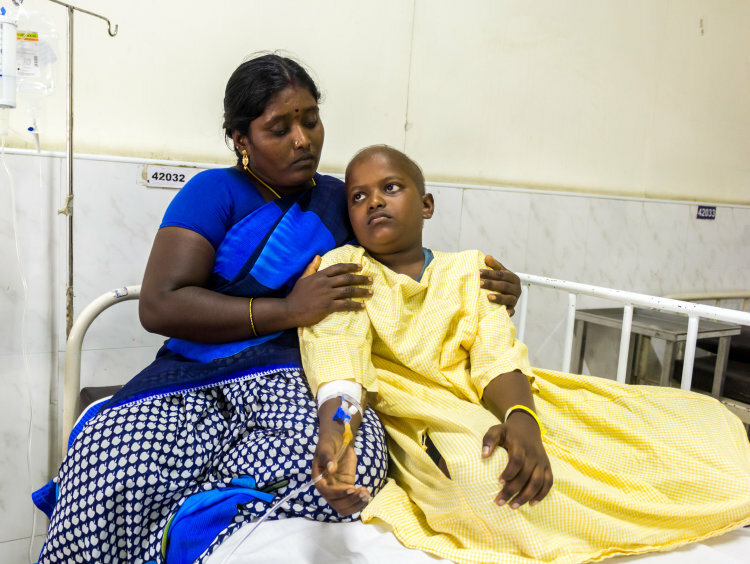 “We tell them that Sridharan has some infection that needs proper treatment. The other day Gunasekaran asked me, ‘Why is Sridharan losing so much hair of late?’ and I had to lie to him that he has a hair infection. If I had told him it’s because of the strong chemotherapy, then he would have definitely broke down and shared his sorrow with his brother. I can’t tell you how difficult it is to keep all your sorrow bottled up inside for so long.”-Jaya Malini, with tears in her eyes. Jaya Malini and Vinayagam make only about Rs 10,000 every 3 months depending on their harvest. If rainfall is bad, then they will not make anything at all. They know that their son will not survive without advanced chemotherapy, but do not have the means to save him. “We have borrowed money as of now to at least be able to take him to the hospital. He is becoming weaker every day. All he does is vomit and sleep. We can see him slipping away from us. We want to save him so we are contemplating selling our cows – our main source of livelihood at the moment to help him. But we are sure that money will not be enough. I hope God will show us a way because we are poor people who do not know what to do at the moment.”-Jaya Malini. Thank you so much for the love and support you have shown towards Sridharan. Here is a quick update on his health - He has undergone four cycles and has responded well to the treatment. Currently, he is at home and has to visit the hospital for the follow-ups. Doctors will schedule the next cycles of chemotherapy after he visits the hospital again. Please pray for his health and speedy recovery. Sridharan is now doing better. He is undergoing chemotherapy currently and has been advised one more protocol of chemotherapy. A visit to the doctor is scheduled for tomorrow and he shall then undergo a few tests, post which the doctors will take a call on the further course of treatment. We are all hopeful about his recovery. Please keep praying.